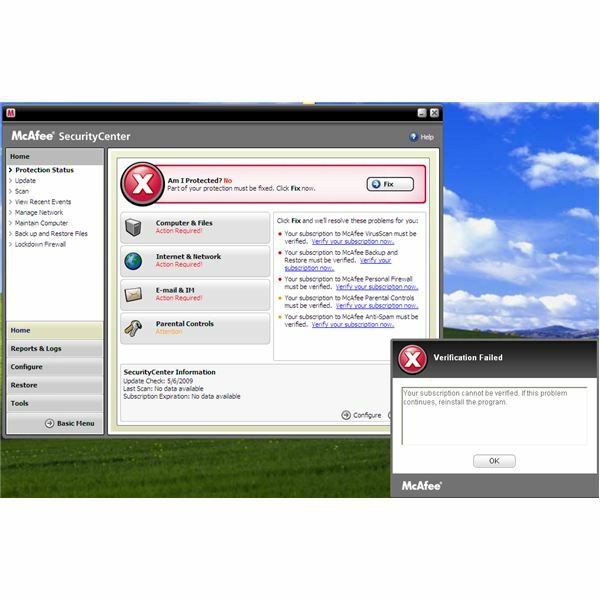 While McAfee may be a very well-established player in the security field, the company’s latest product, McAfee Internet Security Suite, has a surprising number of shortcomings. If you want to go on with the 30-day trial of McAfee be sure that you are calm enough to head for the download and installation because this process may easily get annoying. 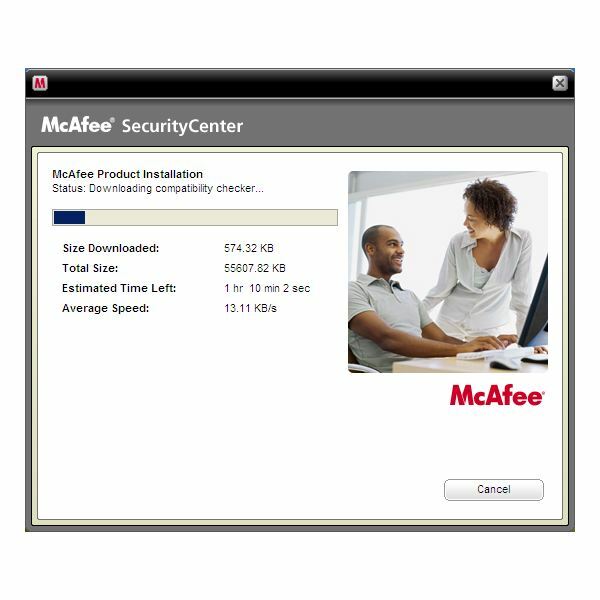 First you have to open up an account in the McAfee website and then add your Internet Security product to cart for download. I do not like the idea of registering to a website and giving my e-mail to verify “I am who I claim to be” and check my e-mail to receive the automatic e-mail and then get back to the website. It all eats up time and I just want to download a simple installation file! When you successfully complete the steps and reach the download page, you will have a small web installer of 650 kilobytes. You save it to your hard drive and run, where it connects to McAfee’s website and downloads the files it needs. I have chosen the “Typical” installation and as of 6th of May, the download size was 55.6 Megabytes. When the download was complete McAfee optimized my system automatically. There was also a habitual reboot. Other than that, the overall installation was very smooth and did not require any user intervention. 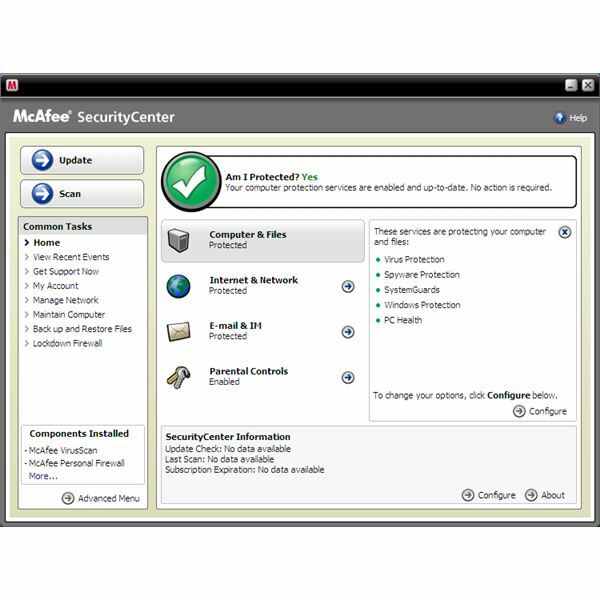 McAfee Internet Security 2009 packs a lot of features and all are accessible under the main window. The features are hierarchically grouped under “Computer & Files”, “Internet & Network”, “E-mail & IM” and “Parental Controls” headings. Virus protection, spyware protection, system guard, Windows protection and PC Health are under “Computer & Files”, Firewall and Identity Protection are under “Internet & Network” and E-mail Virus Protection, Spam Protection, instant messaging virus protection, e-mail spyware protection, and instant messaging spyware protection are under “E-mail & IM” section. These are the main features offered with the normal view. If you switch to the advanced view by clicking on the “Advanced Menu” at the bottom right of the window, you will be able to access additional features offered such as the backup and restore functions. Just as a note, to use the backup and restore functions you need to have at least .Net version 1.1 installed. What I personally liked about McAfee’s overall features is the instantaneous updates. The software always communicates with the master database in McAfee labs. When the program finds out a suspicious file with its heuristics and built-in malware signatures it sends the file to the McAfee labs and receives updates in a couple of minutes. This, in my opinion, is better than Norton’s 5-minute updates. This also works the other way around; if McAfee labs detect a threat, the program is updated immediately. This two-way communication ensures protection against the zero-day threats, but there is a question mark: does it work as it should? The known malware detection rates are very high and McAfee always took the top positions in the competition but not the first place. In terms of unknown malware detection, McAfee’s successful detection rate stays below 15%. As I have asked in the previous paragraph, the question whether or not you can rely on McAfee for the malware detection remains. The on-demand scan times are high and cannot be considered as short. Although there are false positives, I can safely say that it is agreeable. 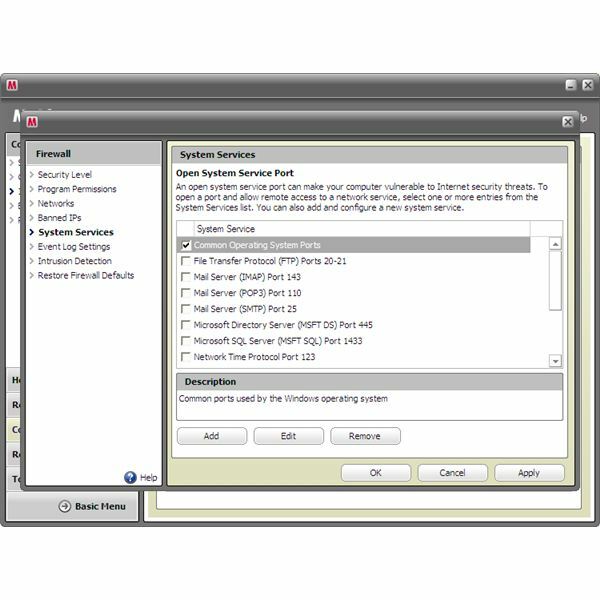 McAfee Internet Security 2009 offers a lot of configuration options under the hood. You can either go to the “Configure” button at the right pane of the window or switch to the “Advanced Menu” and go for “Configuration” and “Tools.” This product offers very detailed configuration options for the users. For the detailed configuration options, I will use the Firewall configuration as an example. As you will see in the screenshot on the left pane, you can set individual IP addresses to ban, set program permissions, see the details of your network and work with each of them in detail. On the plus side, the program automatically configures the Windows services and disables certain ports by default, such as the mail and print server ports. Also you can add more programs and/or services to the existing list and set the permission levels individually. If you are not an experienced user and do not know much about the configuration of the security products, I can safely say that the default settings will be OK. Unfortunately I can not say that the support is strong for the product. The users can receive phone support for 30 days from 6 A.M. to 6 P.M. Pacific time and afterwards support is charged per incident basis. If you suspect an infection at 8 P.M., get your credit card ready because you will be charged at least USD 9. If you will go to the forums, the link is not under support, where you would expect. I had a hard time in finding it, but for your convenience it is here. The product comes with a USD 50 price tag for 3 users. The price to performance is not more than average, which I will discuss in the next section. I have run into some weird problems with McAfee Internet Security 2009. It told me that I am not protected and to solve that there are some problems that needed my attention. When I looked at the security center, I saw that it could not validate my account. I felt very surprised; how can a security product just stops running because it could not validate my account and without informing me? What would I do if I were under an attack? When I clicked on the “fix” button it simply told me that it could not talk with the server. Fine, it is you who cannot talk to your server and stop functioning and it is me who is left unprotected. I have also checked the memory usage of the product. 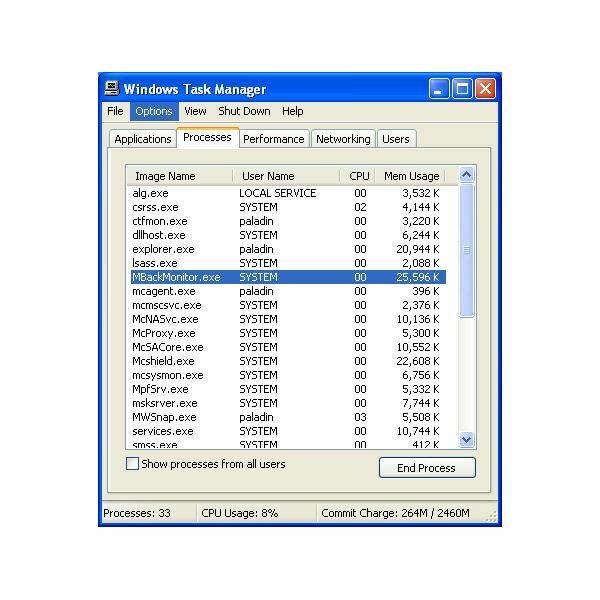 On a Windows machine with dual-core 2.2 Gigahertz processor and 1 Gigabyte main memory, the start-up of the program took more than 10 seconds. When minimized to the system tray and running silently, McAfee used a total of 96,796 Megabytes of memory with all its modules running. This is far more than acceptable. McAfee Internet Security 2009 is not a bad product, but nor is it the best. The bottom line: look for something else. There are considerably better products on the market. Can’t decide whether to buy McAfee Internet Security 2009 or Norton Internet Security 2009? Read our article Norton vs McAfee: Which Internet Security Program is Better? to find out which product will give you the most bang for your buck. Be sure to check out our reviews of other leading antivirus and security products including ESET Smart Security, Norton Internet Security, Kaspersky Internet Security, Comodo Internet Security and Webroot AntiVirus with AntiSpyware.